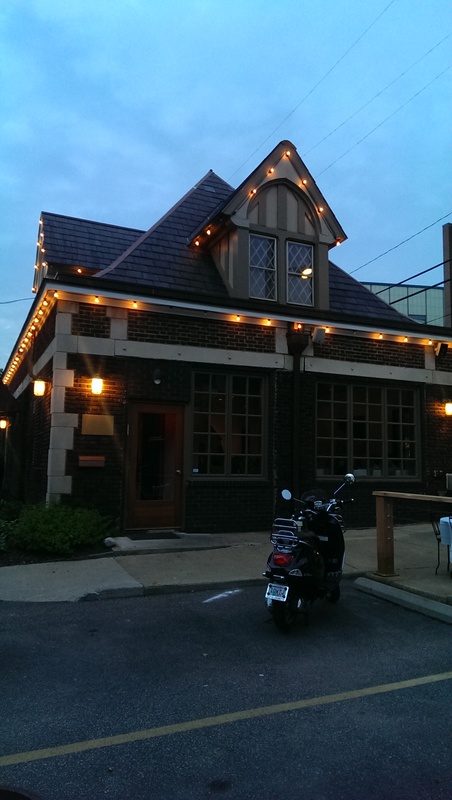 Chef Jonathon Sawyer and his wife Amelia recently opened Trentina, a northern Italian inspired restaurant in the old Sergio’s location, to much fanfare this summer. They raised funds to open the restaurant on Kickstarter, and it was successfully funded in March 2014 by 206 backers. They exceeded their $21,999 goal by $18,000. The food is inspired by the Trentina Alto-Adige region of Northern Italy. The night before I started my diet I met some friends at Trentina for one last hurrah. I can’t imagine a more perfect way to end an era. 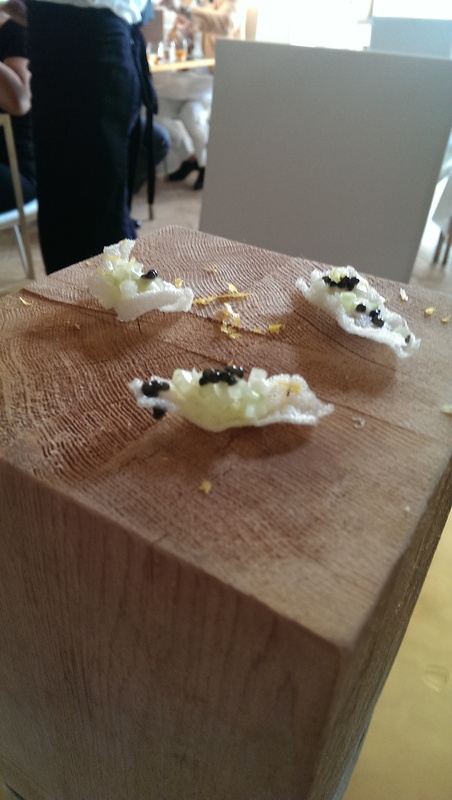 The portions are small, but 12 courses can add up. The courses change with the season, so this review no longer reflects what is being currently offered. In fact, it was no longer accurate a week later. However, several of the stalwarts have not changed. As the Cleveland Scene explained, “Trentina is not for every diner, but rather foodies with a capital “F” who seek out once-in-a-lifetime meals flush with one-of-a-kind creations.” This is fine dining at its best. The 32-seat Trentina focuses on Sawyer’s “Menu Bianco,” a daily procession of tasting courses served in small courses, priced at $100 per diner (purchased in advance and non-refundable) or $115 (if paying at time of dining) – not including beverages, gratuity and tax. We added the wine tasting for an additional $40, but I would recommend just ordering a couple drinks as you go. 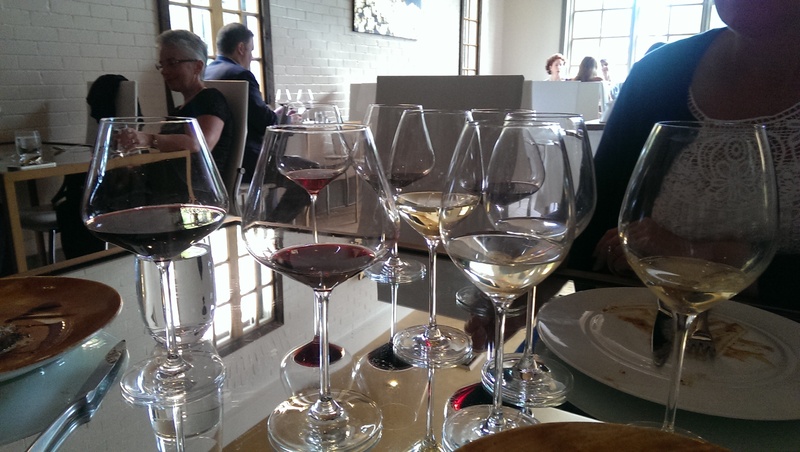 We simply couldn’t keep up with a new wine with every course and at one point had four glasses each in front of us. One of my dining companions chose not to order the wine tasting and enjoyed a cocktail customized to her tastes by Trentina’s beverage director Nate. The cocktail with a coffee ice cube was divine. She also enjoyed one of my wines. We were immediately greeted and escorted to a table. We had tried to get a reservation for 6, but the restaurant could only accommodate our smaller table at an earlier time, which necessitated some of my friends dropping out. The restaurant became packed over the night and quite loud, which is due to the interior design. With mirrored tables and bare walls there is nothing to muffle sound. We had trouble hearing the explanations of the various courses at some point, so please bear with me as I try to recreate the evening. The first course, Primi Assaggio, featured Crusto di Polenta, Charcuterie alla Trentina and Vegetables from Larder & Fields. 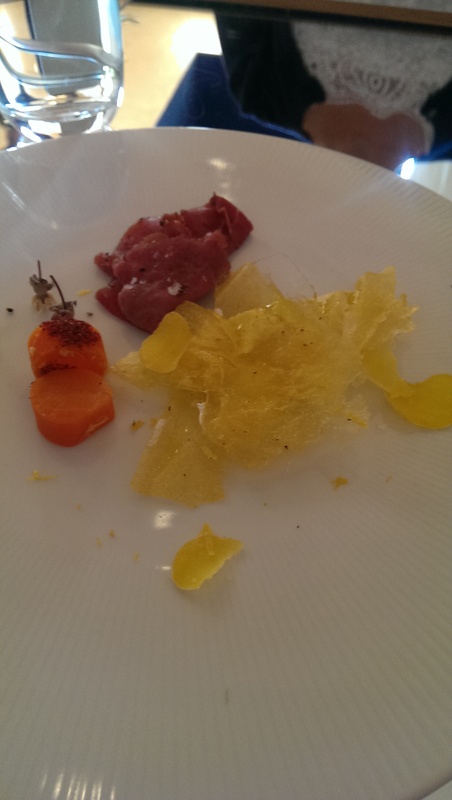 In our case, the polenta was flash fried to a crisp parchment wafer, the charcuterie was a house-cured meat and pickled carrots. 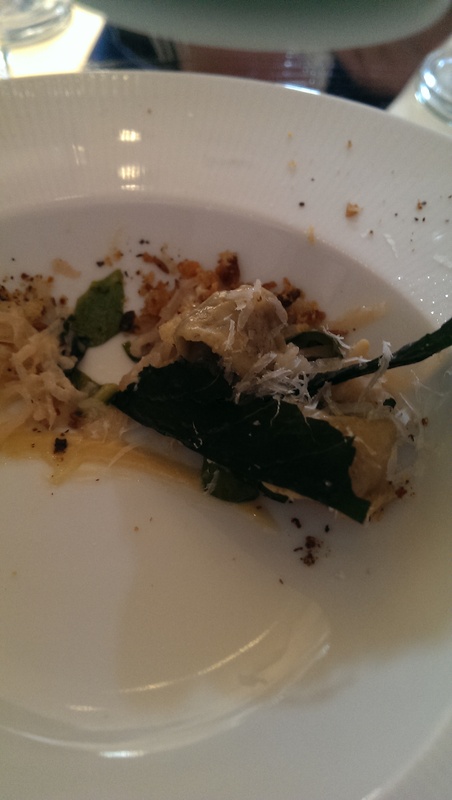 This course featured sumac, cucumber and puffed pasta. I didn’t so much as think “pasta” as I did the puffed shrimp chips you get at a Chinese restaurant. At this point I was thinking, “Oh, I don’t think this is for me.” I quickly changed my mind. Next up they brought out a candle molded out of aged beef suet, edible 24k gold leaf, honey and crunch salt, which melts into a dipping sauce for the crusty baguette that is brought out later. This course started turning me around. The crustacean (conch?) was poached and served on a bed of sea foam. The flavors that stood out were apple and citrus. This innovative dish was a lot of fun. 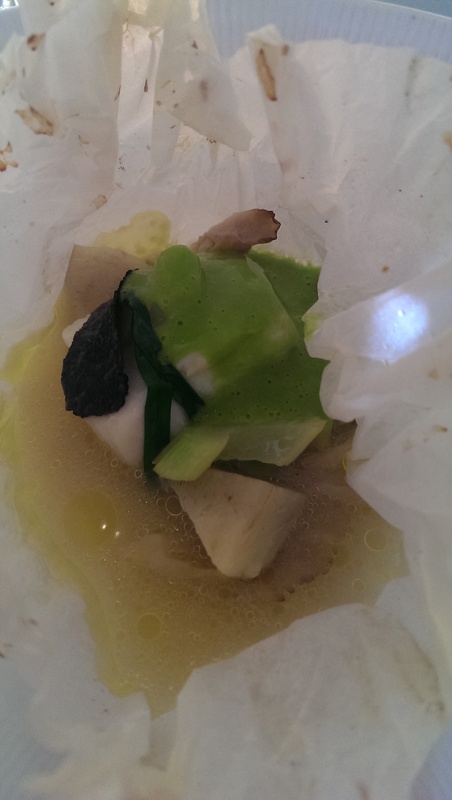 This next course was my favorite of the night – a white fish and foraged mushrooms in a parchment paper. The paper sacks were cut open at the table and steaming, and the sauce was then poured into the parchment. My sauce was a pea puree. I loved the flavors of this. When it came time to revisit a favorite course this one was a very close second. 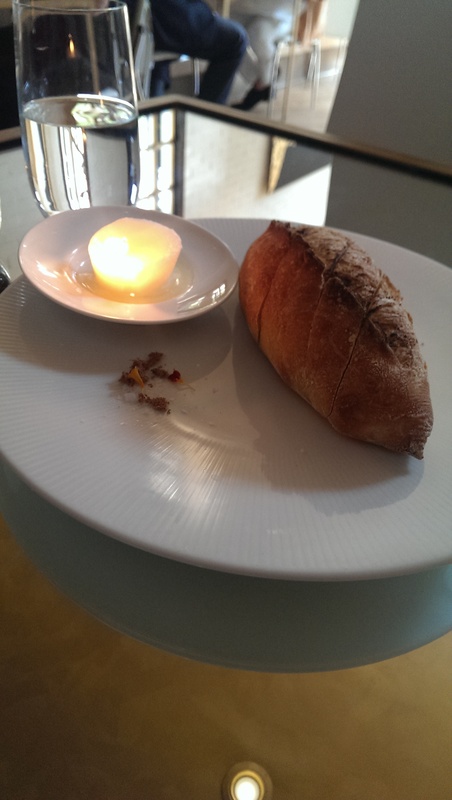 The edible candle had melted down at this point and was a delicious accompaniment to the fresh, crusty loaf of bread from On The Rise Bakery. I love On The Rise. They are the best bakery in Cleveland, so it is not surprising that I loved this course. This next course was another one of my favorites. Normally served with an Ohio farm egg, mine was served without the egg to accommodate my egg allergy (they asked at the beginning if we had any allergies or dietary restrictions, which I appreciated). The pasta is cut with a chitarra, which is a “guitar-stringed” pasta cutter. This long pasta was dressed in a very rich sauce made of egg and lentils. I don’t know what they chose instead of egg, but my pasta did not lack the creaminess of the pasta of my fellow dining companions. The pasta my fellow diners enjoyed had an egg cooked on a wooden spoon in embers, which is then carefully placed over the pasta along with a bit of the ember to the side. This was almost everyone’s favorite course. 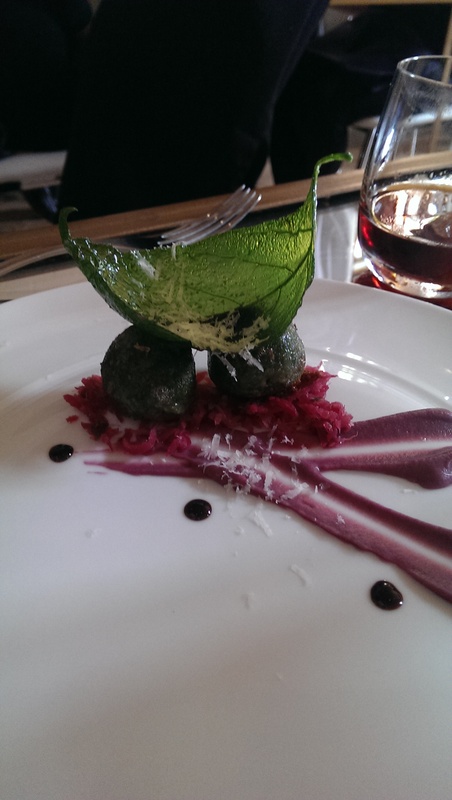 The Strangolapreti (pasta dumpling) is stuffed with Formaggio Che Cola and coated with what I believe to remember were nettles and served with a reduction of cabbage, onion and Spicebush (a foraged berry). This seems to be the stand-out dish of the restaurant and the one everyone talks about. 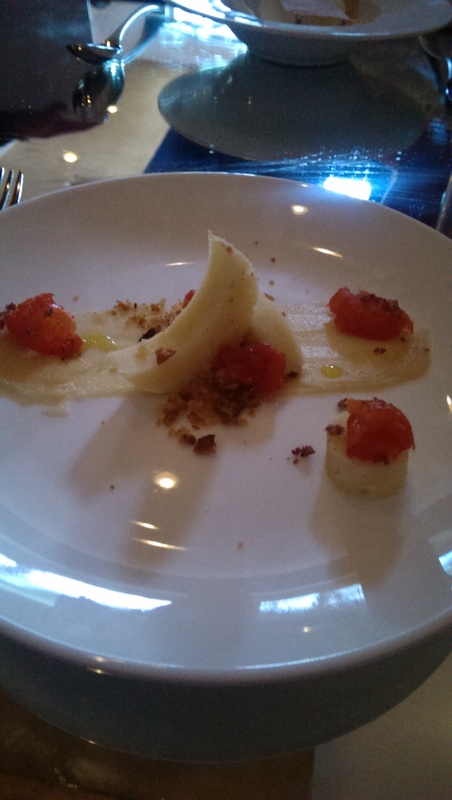 This was the other Pasta Cuscino course. 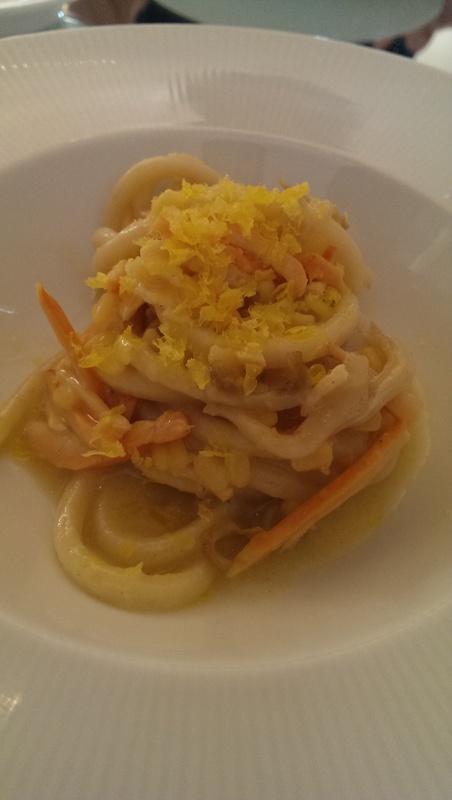 It was a pasta stuffed with crown tipped coral fungus. Game birds roasted in embers was the next course. 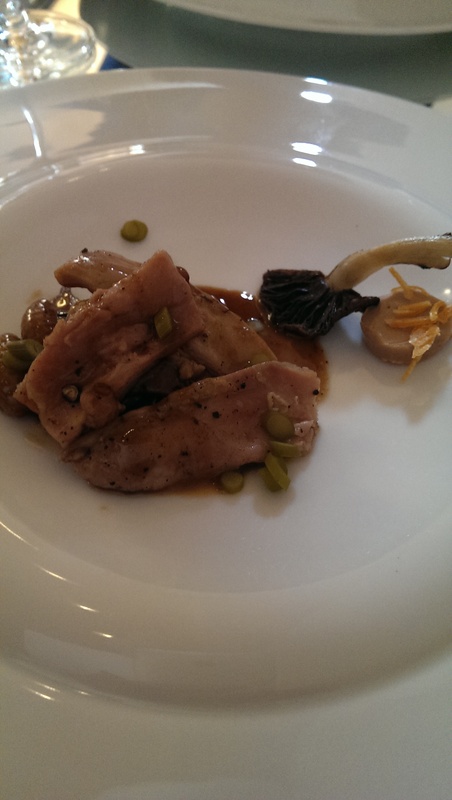 My course featured guinea fowl, foie gras, sauce of oxidized wine, and morels. There was also some kind of lentil or grain served with it. This was a nice bite of bird. This course featured my favorite bite of the night. 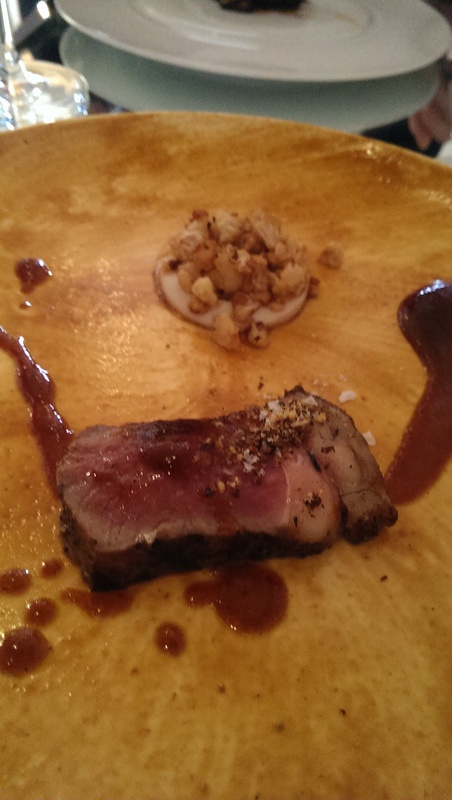 Although the beef was excellent and perfectly cooked, my favorite was the cauliflower puree. 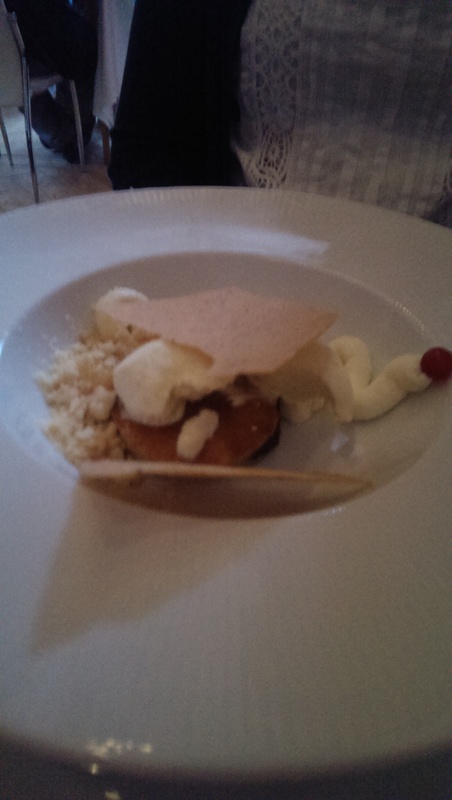 In fact, when it came to revisit a course I decided to just get a portion of cauliflower puree. It was that good. 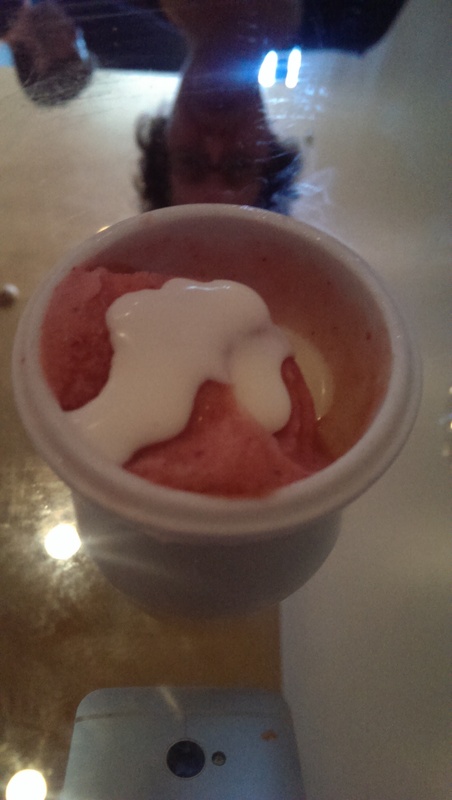 This palate-cleansing sorbet was topped with a light yogurt sauce. 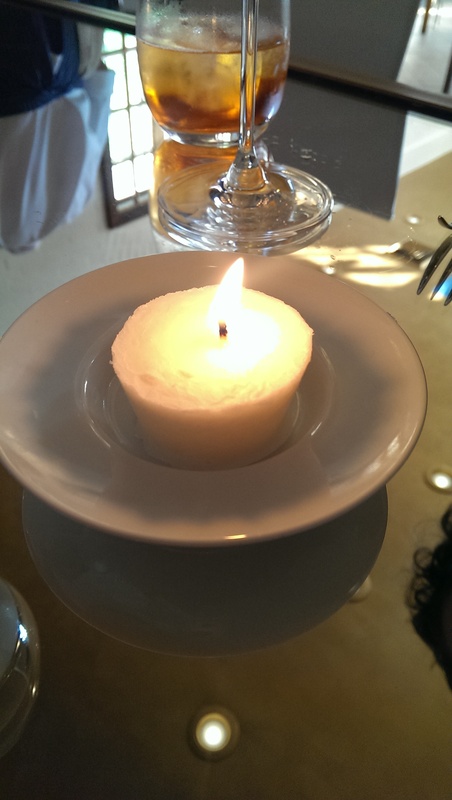 It was a nice intermezzo before the desserts. These three Dolce desserts were the perfect end to a once-in-a-lifetime experience. The course is billed as “fruit and cream.” My dessert was the raspberry one on the right. 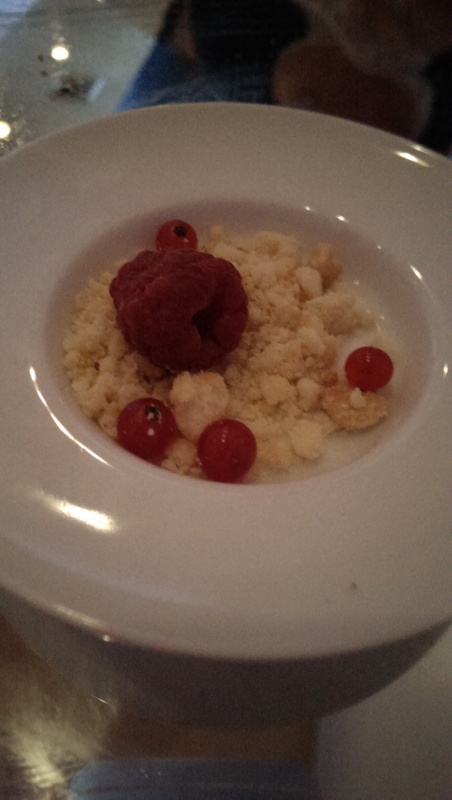 The berries were in season and they were accompanied by what tasted like crispy milk balls. The meal ended with a final course, Grazie, which was a bite of gold chocolate, but I failed to photograph it. I don’t know how I did that. Trentina is now serving lunch as well as a 7-course Pasta Degustazione tasting menu for $60 and an a la carte dinner menu that changes with the season. 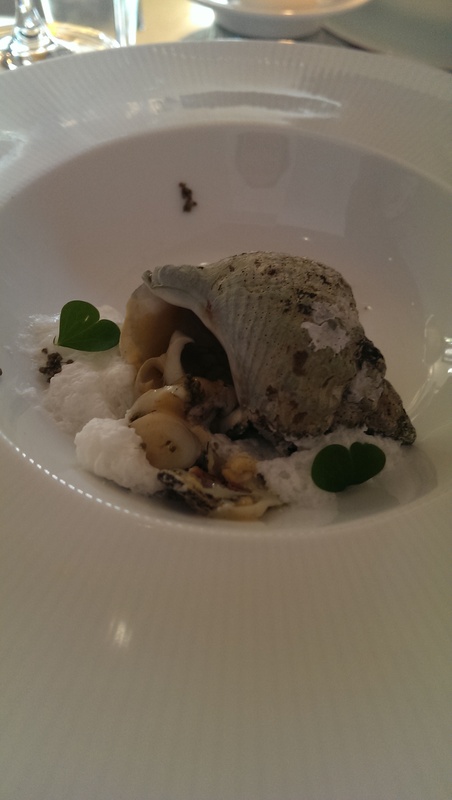 However, I highly recommend the 12-course Bianco menu if you are looking for something special. We walked out of the restaurant full, happy, and, as one diner stated, “so lit” from all the wine. This is definitely a great choice for a special occasion like an anniversary. Chef Sawyer and Executive Chef Matt Danko are outstanding chefs who are passionate about serving local ingredients in a unique way. The service is impeccable and you will be pampered every step of the way.